Take your DIY face masks to the next level! 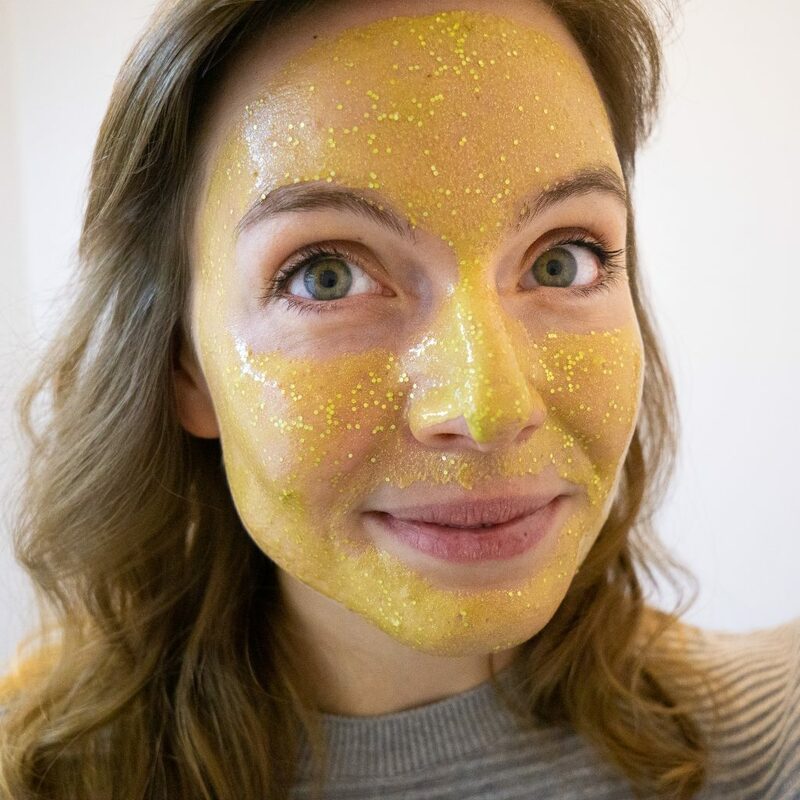 With just the right amount of eco glitter you can turn a functional but plain face mask into a fun selfie proof party mask. Just in time for the Holidays, this mask is a great way to prep for that all important feast or special event. Christmas technically only lasts a day, but somehow we manage to turn it into a whole season of festivities. And you probably have more than one gathering with family or friends planned in the upcoming months. But just as important as the festivities is the prep. From setting up the Christmas tree, seeing the lights go up in your town, the hunt for the perfect gift, the countdown to Christmas evening, leading all the way up to the outfit and makeup you’ll wear on the Day. If you ask me, the getting ready part is just as important as the event itself. And nothing preps your skin better pre party like a face mask. 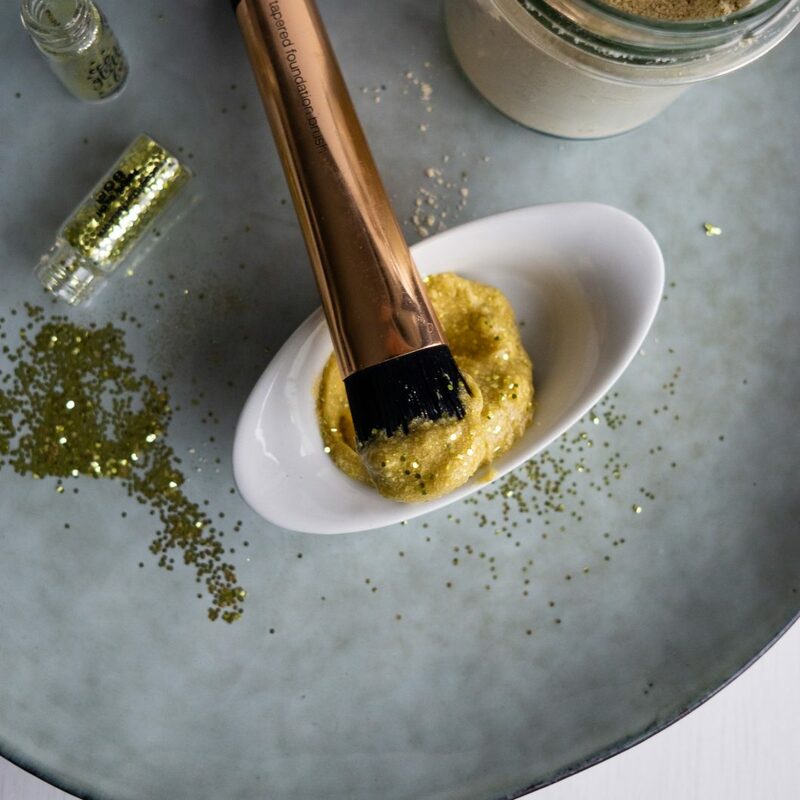 This glittery face mask not only makes your skin selfie ready, it’ll get you in the perfect festive mood! 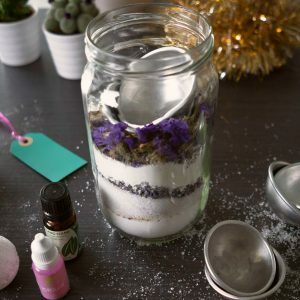 How about as a DIY Gift Idea? You can also turn this face mask powder into a sparkling gift! All you need is a pretty jar, a cute label and a personal message by you. This face mask powder is made with all natural ingredients, like clays and oatmeal. And of course, the icing on the proverbial cake, glitter! 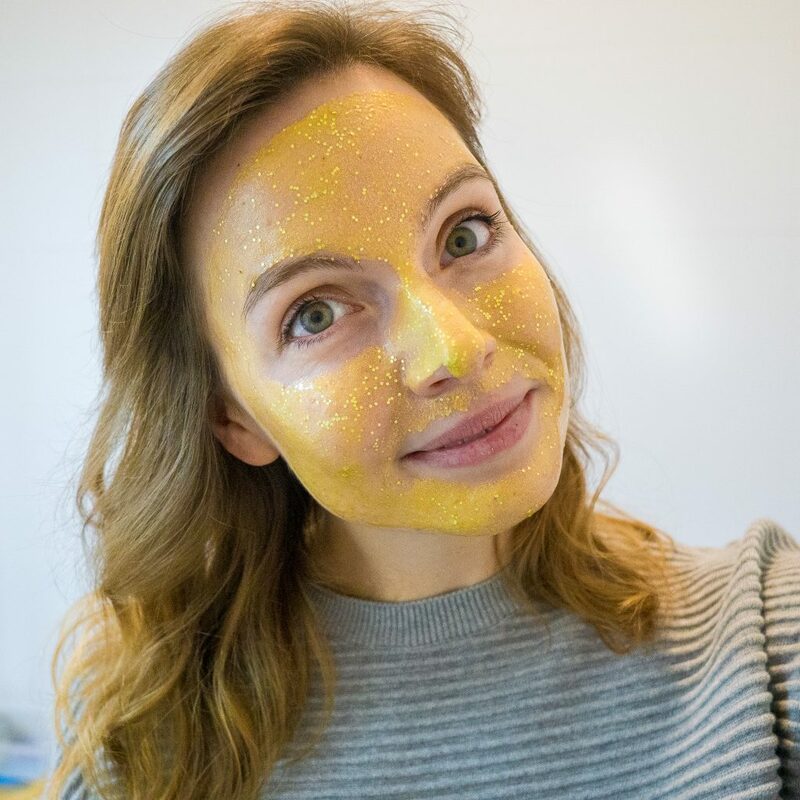 To make sure you can keep this face mask for a longer period of time, we’re only combining the dry face mask Ingredients and the bio glitter. Think you can’t find one flaw about glitter? Well, be prepared to have your mind blown. Because the one flaw glitter has is pretty huge. Glitter is made of plastic. I’m leaving a dramatic pause here, because I’m pretty sure images of shores washed up with plastic cups and fishes stuck in plastic packaging come to your mind. Glitter is actually made of small plastic particles. And even if these particles are tiny, if you use them for bath bombs and other bath and beauty products they still go down your drain. Did you just see your glitter dreams shattered to pieces? Glitter can also be made out of other stuff, like biodegradable materials! When I first heard about Eco Glitter Fun a whole world opened up for me. 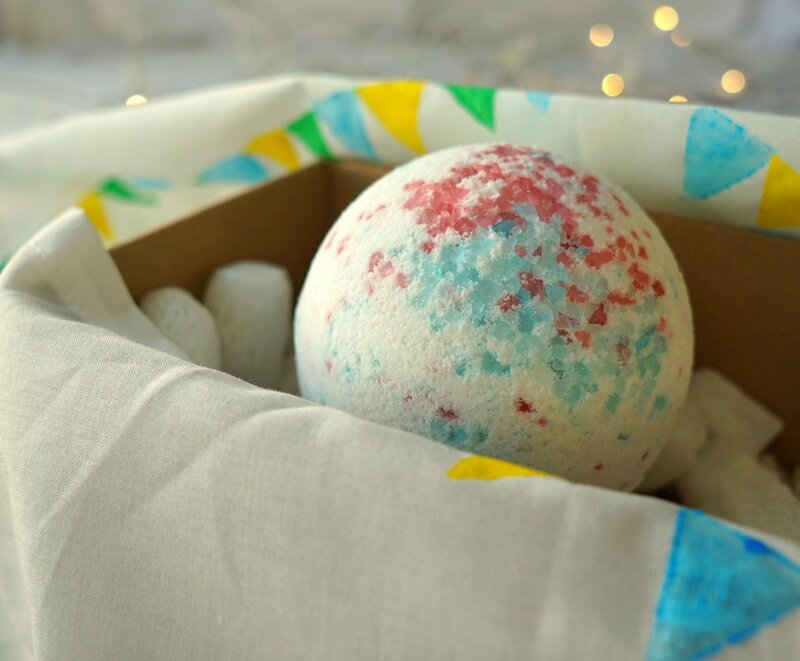 They make biodegradable glitter from sustainably sourced plant based materials. It looks just like regular glitter, but as soon as it comes into contact with soil, compost or waste water it will start to break down. And, good to know, their products have never been and will never be tested on animals! So I reached out to them, fangirl’ed a little, and they offered to send me some free samples to try. What I received was 3 little bottles full of glitter awesomeness. You can get bio glitter in pretty much all the colors you can think of. The size of the particles also range from fine to uber chunky. It’s no joke when they say that glitter gets EVERYWHERE. So do expect some cleanup when you open and close the bottles. I was actually surprised how easy it was to clear away any loose glitter getting away. Just a quick vacuum and they’re gone. A little goes a long way. One bottle holds about 2 heaping teaspoons of glitter and that was more than enough to make this glitter face mask powder base! You can get at least 15 applications (aka glitter face masks) from the recipe below. First you make the Glitter Face Mask Powder. With this powder you can mix up a face mask at any time! Kaolin clay: The base for this powder is white kaolin clay, a gentle clay that’s suitable for most skin types.This white clay absorbs excess oil from your skin. That oil can lead to shine and impurities. Pimples are not my accessory of choice for a big night out! Learn more about these clays in my post about DIY Clay Face Masks. Oatmeal: This breakfast favorite acts as a gentle scrub for your face. It soothes the skin and takes away redness. For this recipe you’ll need very finely ground powder, also known as colloidal oatmeal. You can buy this powder, or make your own by grounding it in a clean coffee grinder or high speed food processor. Gold mica: Cosmetic mica adds a nice touch of gold to your face mask! You can buy them in all kinds of colors online. 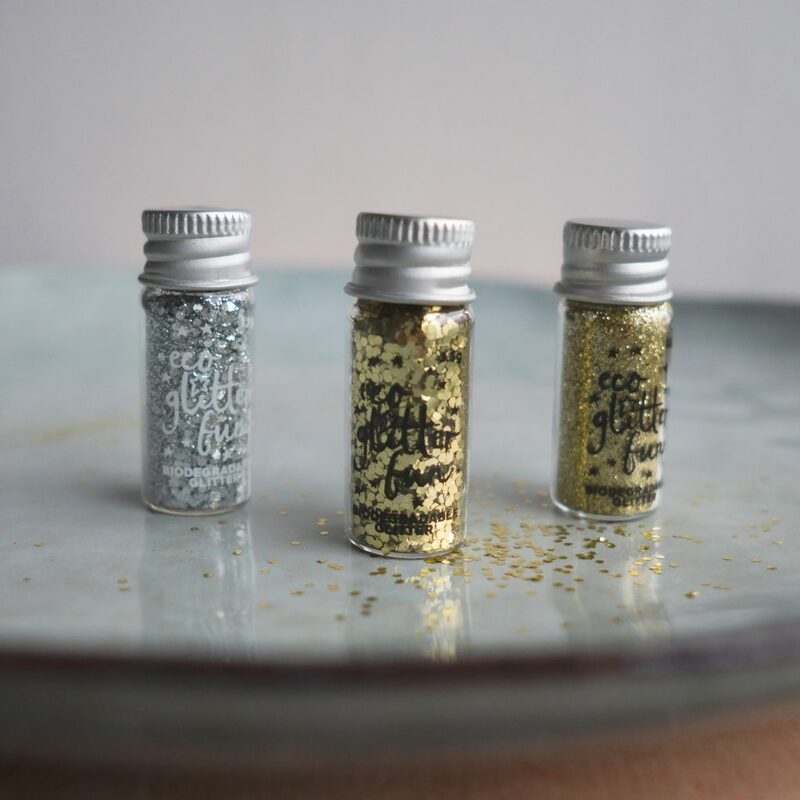 Biodegradable glitter: Now this is where we’re going to add the sparkle! Just a little goes a long way. It might not be very noticeable in the powder, but as soon as you mix it up the glitter will reveal itself! This is everything you need to make the dry face mask powder described in the recipe below. Now here’s what you need to do if you want to mix up your mask! Whenever you’re in need of a Glitter Face Mask (any reason will do), you can mix it in a pinch. Scoop 1 heaping teaspoon out of the container into a separate small mixing bowl. Add about the same amount of liquid of your choice. Stir until you have a paste and apply to your skin! Honey: Both moisturizing and anti bacterial at the same time, honey is a great choice for acne prone skin. Because of its gorgeous golden color, it also really brings out the glitter beautifully. I recommend to use organic, raw honey. If the face mask mixture turns out too thick, you can add a splash of water. For a vegan alternative, try maple syrup! Milk/yogurt: The natural lactic acid in milk and plain yogurt gently exfoliates the skin, removing dead skin cells. Straight from the fridge it also has a nice cooling effect on the skin. For a vegan option you can experiment with pure plant based milks and yogurts. Flower water/water: An easy and obvious choice is of course water. Step it up and use a flower water (also known as hydrosol) instead. Common flower waters are rose water and witch hazel. After you’ve mixed your face mask in a separate mixing bowl, it’s time to apply it to your face. 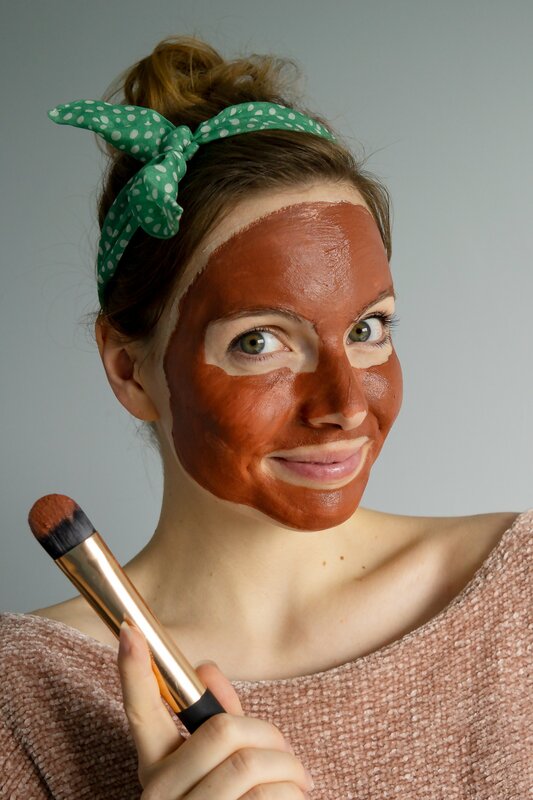 Use a makeup brush or face mask brush to apply an even layer of the paste onto your face. Let the face mask sit for 5 to 10 minutes and let the dry. Depending on the liquid ingredients you’ve used, the mask will dry quicker or not at all. Rinse your face with plenty of water. You can use a damp wash cloth to help remove all bits of the mask. Some of the glitter might stay behind on your face. I actually like this, as it’s a perfect base for any party proof makeup look! If you’re not into this, you can remove the glitter with a mild toner, like micelar water. I also want to say that at no point a face mask – homemade or store bought – should sting, burn or hurt. If this happens remove the face mask immediately and seek advise. You might be allergic or sensitive to one of the ingredients. 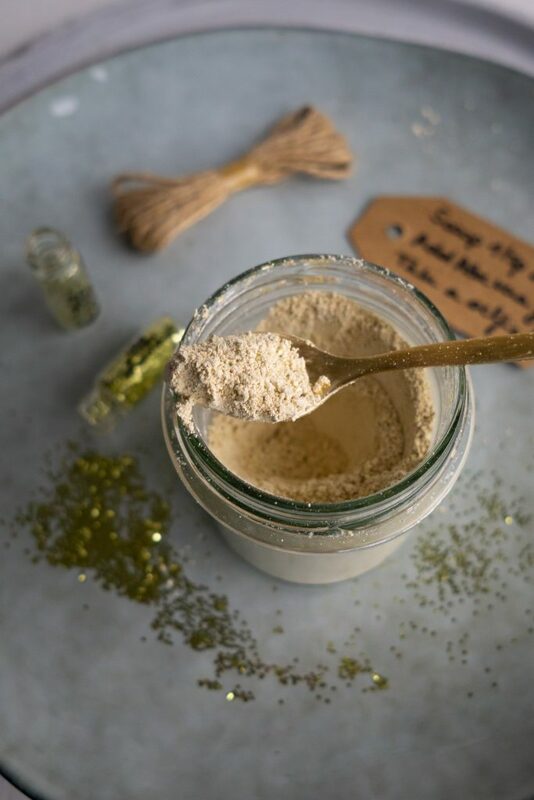 Now that you know everything there is to know about Glitter Face Masks, it’s time we make our powder base! 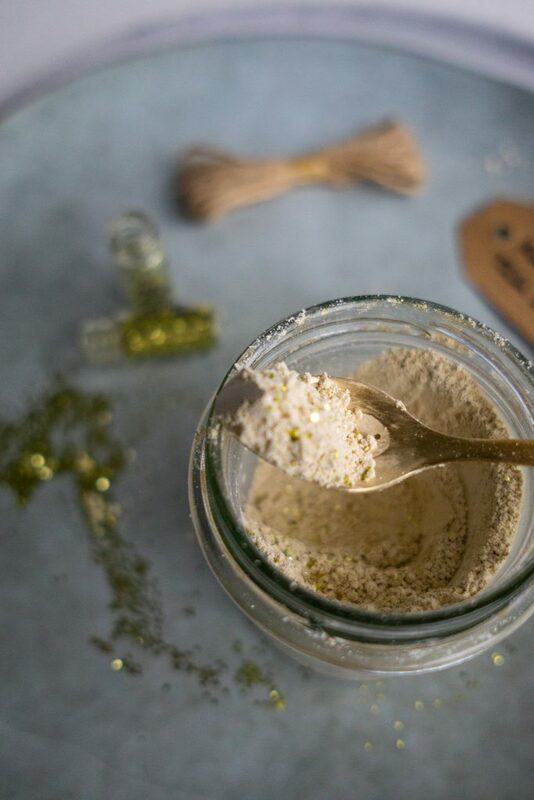 Make this Glitter Face Mask Powder so you can store it and take it out whenever you need to give your skin care routine some sparkle! Scoop 1 heaping teaspoon of powder in a separate mixing bowl and add your liquid of choose! Scoop the white Kaolin clay into a mixing bowl. Add finely ground oatmeal and stir to combine. Add gold mica and bio glitter and stir until the powder has an even color. Keep all water and liquids out of the container to make sure the powder will last as long as possible. If kept with care the dry powder can keep several months. As soon as you mix the powder with a liquid you have to use it right away. To make a face mask, mix 1 teaspoon of face mask powder with 1 teaspoon of liquid (see options in post). Blend until you get a smooth paste. Apply an even layer to your skin and let sit for 5 to 10 minutes. Rinse off with plenty of water. This post contains affiliate links. It means that I make a small commission if you buy something via these links (at no cost to you!). It costs you nothing and helps me out a lot, but feel free to search for ingredients on your own! Look at that guilt-free sparkle! 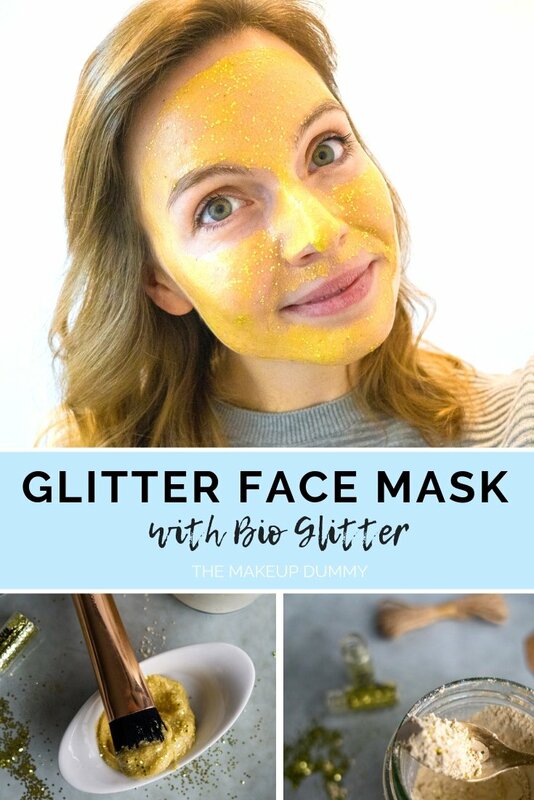 If you make your own Glitter Face Mask don’t forget to tag me on Instagram @healthy.happy.ina or send me an email at ina@themakeupdummy.com.